And then this happened… again!! So we *planned* on yesterday’s post being our last post of the year. And then this happened… again! 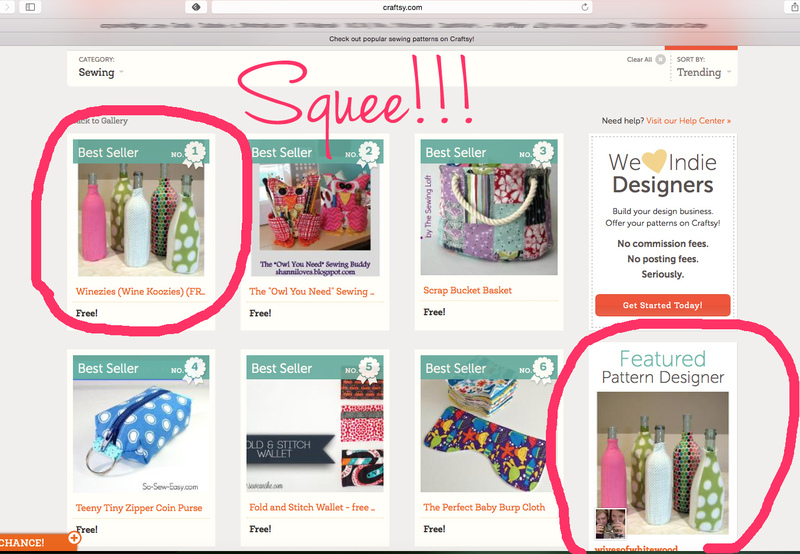 We uploaded our latest free pattern – Winezies (aka Wine Koozies) – to Craftsy almost a month ago and got some downloads here and there, but today the stars aligned and we’re the number one free pattern on Craftsy again today! We’ve gotten a few hundred downloads in the last several hours, and we’re so excited to be able to share our patterns for free so anyone can try us out and see what we’re all about. So head on over to our Craftsy shop to download either of our free patterns – Winezies or Wine Totes (which is just about to reach 3,000 downloads!!! what the what?!?) – or to buy any of our other patterns. So we’ll wish you all a Happy New Year once again, and unless sewing pigs fly, we’ll see you in 2015. We can’t believe December is almost over and that this will be our last post of the year! We hope that all of your holiday sewing dreams came true. Our families know us too well and bestowed on us lovely giftcards that speak directly to our fabric hoarding hearts. Bless them. And in the spirit of giving, we both sewed up some special projects for our loved ones. Sadly Courtney completely forgot to photograph the sweet stockings she sewed up for one of her dearest friend’s little girls. (Even worse, she still hasn’t finished up the doll quilt for her daughter. Thankfully, two year olds are none the wiser if Christmas comes twice this year.) Ali was smart though and took these fantastic shots of the Whole Shebang she sewed up for her beautiful niece Gracie. Gracie is a little firecracker and needed a bag for all of her cheering gear in her new elementary school’s colors, black and orange. Ali did the most amazing job using fun and youthful black and orange prints that convey Gracie’s school spirit but doesn’t look too boring or collegiate. Ali lengthened the handles of the Shebang from the original pattern so it would be easier to carry when full of pompoms and uniforms. And it’s this ease with which you can customize this pattern that makes it one of our top sellers and one that we go back to sew over and over. Finally, she added the sweetest touch – Gracie’s name embroidered on the side of the bag. How fantastic is that??? Gracie flipped when she saw it and we know it will be well loved and well used for years to come. If you want to sew up your own Whole Shebang, you can buy it via instant download in our Etsy shop or our Craftsy shop for only $9. The PDF pattern has 16 pages and over 40 color photos. If you want to read more about the pattern, you can check out the original blog post here. And send us pictures of your bags, please!! We would love to see them and showcase them on our blog. First we owe you an apology. We had every intention of releasing our next free pattern/tutorial before Thanksgiving, but we both got downed by absurdly prolonged illnesses. One of us got it at Disney, the other at preschool drop-offs and pick-ups (anyone noticing a theme here???). Anyway, onto the main event. So what is a Winezie? A koozie for your wine bottle, of course! So now, just in time for the last-minute-holiday-gift-season, we’re sharing our great new free pattern which makes any of three different sized Winezies – a standard 750mL bottle, a magnum 1.5L bottle and a champagne bottle. One of the fantastic things about the Winezie is that you only need one fat quarter to make one (or a 16″ x 16″ piece of fabric). So you can also use scraps to make a fun coordinating Winezie. You will also need 4 elastic hair ties and 4 buttons. That’s it! We suggest using fleece, flannel or cotton for your Winezies. We also sewed some up in a knit, but if you decide to use a stretchy fabric, be aware that the 750mL template will actually fit a 1.5L magnum bottle. Another fantastic thing about the Winezie is that it’s a super quick sew. We can whip one of these up in less than 30 minutes, which makes it the perfect last minute holiday gift or host/hostess gift. You can make just one, or an awesome set to give to all of those wine lovers in your life. When testing the Winezie, we found that wine bottles are not standard sizes. We modeled the templates on Barefoot wine products. We included notes at the end of the pattern to alter the templates for other bottles that are taller or narrower than Barefoot products. If your bottle is wider than Barefoot products, use a stretchy fabric to sew the Winezie. Finally, we also didn’t “just forget” to draft a Chardonnay bottle template. Okay, here goes… deep breaths…. We. Are. Chard. Haters. There, we said it. So don’t ever expect any Chardonnay love from these ladies. LOL. The Winezies measure approximately 10” x 3” (750mL), 11” x 4” (1.5L) and 9” x 4” (champagne). We really hope you enjoy our second free pattern. As always, send us any questions or comments, and especially send us any pictures of your finished Winezies, as we would love to share them! Happy holiday sewing!